We live in an age where information is readily available. With just a click, you can easily access resources on just about anything. As a result, you can simply look something up on the Internet, find out how it’s done, and decide that it would be your next do-it-yourself project. This includes getting rid of a pest infestation in your home. Initially, you may think that you can drive unwanted critters away from your abode on your own. Besides, how hard could it be, right? All you need is a trip to the hardware store to buy insecticides and pest baits, and you’ve got everything covered. However, pest extermination is not as simple as that. In fact, going the DIY route in battling a pest infestation can backfire on you, your home, and your family. Of course, that’s the last thing you would want to happen. 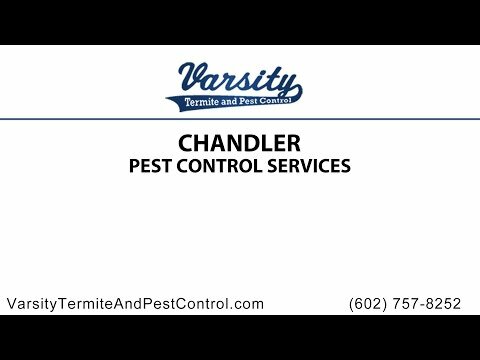 So, do professional pest services Chandler really matter? Yes, and here are three reasons why. 1. Professional pest services can save you money. The main reason that makes people think twice about seeking professional help for pest concerns is the cost. These services come at a fee, and they may cost you hundreds of dollars upfront. But that will be nothing compared to the thousands of dollars you will spend on renovations and repairs if a pest infestation went out of control because it was undetected or wasn’t dealt with properly. 2. Pest professionals have the right know-how. Exterminating pests is not simply placing poison at the corners of your house or spraying insecticide in a room. Sure, they may provide temporary solutions, but they will not nip the problem from its root cause nor will they eliminate the pests completely. Professional pest exterminators have the training and technical know-how to carry out an extermination plan that will not just drive out the pests but will also prevent them from coming back. More so, they also take into consideration several important factors in order to create an action plan that’s suited to your situation and needs. Purpose for the inspection – Is it for preventive measures or is there an existing pest problem that needs to be addressed? Level of infestation – Pest professionals have the training and technology to accurately detect the level of infestation in a property. You may not see a lot of insects in your living spaces, but they may already have a huge colony behind your walls. Based on the information pest professionals gathered about your property, they will create a pest infestation treatment program that’s specifically tailored to address your unique situation and needs. Aside from exterminating the pest, the program will also be geared towards keeping those pests away from your property. Aside from their training and expertise, pest professionals have the right equipment and resources to carry out proper extermination. Typically, they have access to tools that are not readily available to consumers like you. Pest professional are also aware of the hazards of the chemicals they use and the possible dangers of attacking certain types of pests. As a result, you can be sure that toxic chemicals found in some pesticides will not harm you and your family. Chandler pest control technicians know which tools are safe to use indoors, and which ones should be administered outdoors. They know whether chemicals are friendly to the environment or harmful to you, your family, and your pets. More so, they know how to properly tackle pests, because some of these unwanted creatures can attack you or swarm around carrying harmful bacteria when their nest is disturbed. Pest professionals prevent that from happening and contain an infestation completely; not leaving any destructive trace in your home that can affect you and your loved ones. 3. Pest professionals are flexible and will work around your schedule. You don’t need to skip work or other important activities just to accommodate pest professionals, because they work around your schedule. In fact, they can work past the typical work hours and even on weekends just to accommodate your needs. More than that, they also know when is the right time to retreat your home, which is what most people tend to neglect when they exterminate pests on their own. Recognizing the need for professional pest control services is a good start, but what’s more challenging is finding the right pest company to work with. To make it less arduous for you, here are some steps you can take. Take advantage of free estimates. Pest control companies typically offer free estimates. Let two or more companies take a look at your property. Aside from finding the best deal, this will help you find out the culture of a company. Remember, employees speak volume about what the company is all about and how they do business. Ask around. Ask your friends and loved ones about pest companies that they’ve worked with. Their recommendations can be reliable because nothing beats first-hand experience. If they are satisfied with the service of a particular company, they will most likely refer it to others. Take notes. Talk with several companies, and if possible, allow them to take a look at your property. This will not just help you find the best people for your needs, but this will also let you learn more about your situation and pest management in general. What are the treatments necessary for my situation? What is the goal of the program? Is it to eliminate the pest or simply contain them? What are the tools and pesticides needed? Are they eco-friendly? Will it post any harm to my family? What trainings did your technicians undergo? What if I decide to cancel your services? You know a company is worth dong business with if they provided satisfactory answers to those questions. Just to be sure, you can also check with your local business bureau if there are any complaints filed against them. Your home is your most valuable asset, and you must take the necessary steps to protect it. One way to do so is to seek professional pest services in order to keep unwanted creatures away from your property and prevent them from causing any form of damage. More than the inconvenience that you will be spared from, relying on professional pest services also offers peace of mind. Nothing compares to the sense of assurance that you, your family, and your house are safe from harm. Contact us today!